Pets are very important to the Weiswomen and I thought it might be fun to share a little bit about the furry creatures that have been so important to us. I'll start with the Massachusetts branch of the Weiswomen Creations family (a.k.a., Me!). I know I mentioned earlier that we have a new canine addition to our home. But before I get to him I feel that the original Weiswomen Creations pet should get some recognition even though he's no longer with us (consider that your spoiler alert if you don't like reading about illness and animals, this gets a little maudlin). He's the handsome creature pictured here: Pierre. And before you ask, I don't know why he's named Pierre, he came to me with that name. To be honest, I've never been a cat person. Our family always had dogs and my father is violently allergic to cats (and I mean violently - when Pierre was still with us my father lasted about 5 minutes in our house and then had to leave). I basically accidentally adopted him when I lived in New York City. 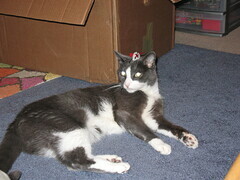 In 2000 (I actually think it was New Year's Day), a friend called looking for a temporary home for Pierre - someone was supposed to be adopting him but they were out of town. After warning my friend that I had no idea how to take care of cats, I suddenly had a cat in my apartment. More precisely, I had a cat under my bed. Eventually we lured him out with a straw (don't ask, that cat ignored most of the toys I bought for him but a plastic straw could make him ecstatic). One of my best friends came over and smugly said "you're totally keeping that cat." "No, I'm not," I replied, "This is just temporary." You all know where this is going...after a couple of weeks the intended adoptive cat-parent was still away, nobody knew when he coming back, and I was smitten. When I moved to Maryland to start a PhD program Pierre of course came with me. It was a bit of an adjustment for a city cat but once he got used to those strange things called trees outside my apartment window he was fine. Then I met the man who eventually became my husband and I eventually moved to Massachusetts to be with him. He was not a cat person but knew we were a package deal and that Pierre had been with me longer than he had. So, Pierre ventured up north for his third home. I curious how he would deal with our new house - he was used to one bedroom apartments and now we were in a house with lots of stairs. We arrived very late at night, after a long day of travel in his carrier. We let him out and he immediately began racing around the house. Apparently stairs were pretty cool and all the extra room was great for running around the house at top speed. All was happy and good in our little world. My boyfriend and I got engaged and then married and Pierre made a special appearance in our Save the Date newsletter. My husband admitted that Pierre wasn't bad "for a cat." In February 2007 I was trying to finish my dissertation. First we had a pipe break in the house. Then the next week I took Pierre to the vet for a routine exam (he was now a "Senior Cat" at age 11) and they discovered a lump in his throat which was eventually revealed as a tumor. I'll spare the gory details and crying that ensued but February was a pretty horrible month. They said he had a few months to live. I then informed Pierre that he needed to live long enough for me to finish my PhD, there was no way I could deal with the last stages of my dissertation and grieving his loss at the same time. People scoffed but he was still going strong when I finally finished my PhD in May. Then I told him that he needed to hang on long enough for me to get a job. During my job search my mother and I started Weiswomen Creations. Our amazing vet said that clearly my directives were working since he had already lived past their predictions. In September, a week after I was offered a permanent job my husband and I could tell that the end was near. I know this is cheesy and overly sentimental and has possibly crossed the line into "crazy cat lady" territory. but I do believe that he hung on until he knew I would be ok. He came into my life just as I was applying to doctoral programs and stayed until it was all over. So, that's the first Weiswomen pet. Hopefully I haven't bummed all of you out but I felt Pierre needed his moment in the sun before we fully introduced our dog. Pierre was a pretty big Diva so I'm sure he would agree with my decision.